When I was in college, I fondly remember being a broke college student, and spending $7 on a chicken caesar pita & $4 on a frozen margarita (since they were 2 for 1 and my friends and I would pay half of $8 for the price of 1) when I went to Chili’s. They were crazy sweet, tasted like a popsicle and I’m fairly certain the calories were just absolutely bananas. However, those frozen margaritas introduced me to one of my favorite drinks. 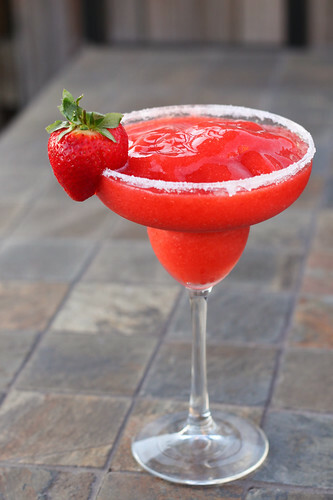 I just love a good, fruity margarita, and sadly, until last year, I only made margaritas out of a bottled mix (I know…calories..). Place all ingredients, except for the salt/sliced limes meant for the garnish, in a blender. Blend the mixture until the ice is crushed, and everything is thoroughly blended. To garnish, wipe lime juice from a lime slice around the rim of your serving glasses, and then dip the rims in coarse salt (or sugar). Garnish the rim with another sliced lime and/or a sliced strawberry as well. Pour into glasses and serve immediately. « Vanilla Sugar-Crusted Scones & A Giveaway!